We offer a unique service allowing you to design stylish bedroom wall panelling to your chosen colours, materials and specifications. 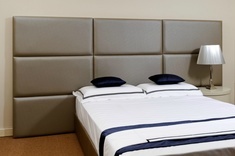 Used as a wall mounted padded headboard for a bed or as an elegant backdrop, the padded wall panels are designed and upholstered to suit the character and colour scheme of your bedroom and all are manufactured in our Glasgow workshop by our experienced craftsmen and upholsterers. All our upholstered and padded panelling styles come in a wide range of colours and fabrics. Luxurious wall panels create a unique and sumptuous setting to finish off the look of your bedroom and can be crafted in almost any size, style, colour and fabric you can imagine. Design your own or choose from one of our examples – contrasting piping, colourful buttons, maybe add your own sparkle with some crystals and changing the height and width to suit your bedroom (as high, low or wide as you wish, it’s your choice). 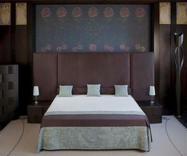 To have your own handmade panels simply choose the style you like and the size required. Then select the fabric or contact us about using your own material and we will make your dream a reality. Please don’t hesitate to ‘phone us on 0141 632 1384 or email our designer at design@robinsonsbeds.co.uk. Alternatively, visit our showroom/workshop for a chat and view the vast range of designs, fabrics and colours available. Free fabric samples are available on request. 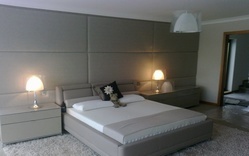 We are suppliers of padded headboards and upholstered wall panels for interior designers and regularly deliver throughout the UK including to London, Edinburgh, Manchester, Birmingham, Liverpool, Newcastle, Cardiff, Glasgow, Aberdeen, Kent, Surrey, Sussex, Suffolk, Hertfordshire, Bedfordshire, Buckinghamshire, Oxfordshire, Cambridgeshire, Lincolnshire, Wiltshire, Hampshire, Dorset, Devon and the South West, Cheshire, the Midlands, East Anglia and the North West.